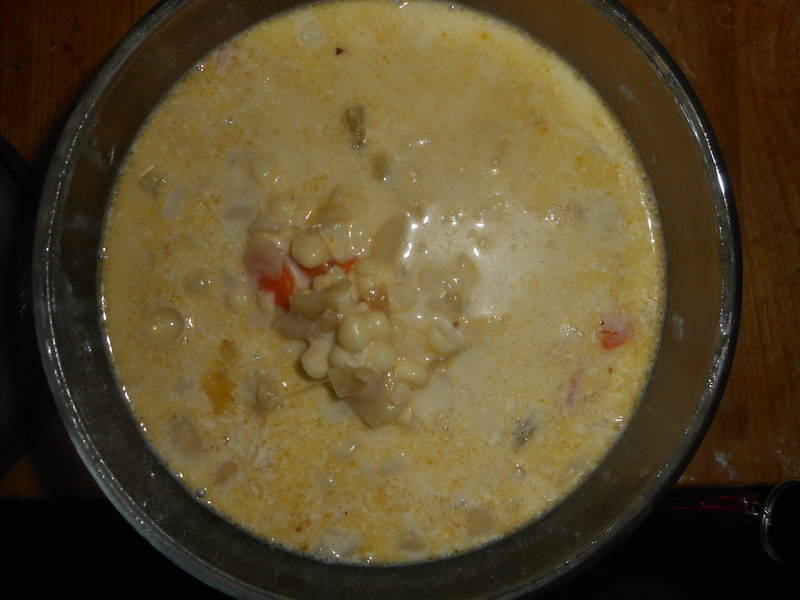 Corn Chowder, Delightfully Fresh and Delish! Corn on the cob continues to be tasty if you can source it locally. I found some the last two weekends and have made some delightful corn chowders. While both were excellent I chose to share this slightly more traditional version with you. Using just 2 big ears of corn I was able to make 4 servings of hearty soup. I took a recipe off the epicurious website and made only a few changes – it was very easy to put together. This version met my three qualifications: gluten free, simple and yummy. Even if the corn you find isn’t the greatest this late in the season I am betting this chowder will be a hit with your family. The mixture of veggies adds so much flavor especially since they are not masked by a lot of spices. Notes: I put in the cobs (I cut each one in half to fit) as my soup broth simmers because they are crammed full of corny flavor that can perfect your chowder. Do not leave out or change the cream; it isn’t that much per serving and it won’t have the right consistence without the heavy cream. Finally, be careful with the broth; a lot of commercial broth’s are not gluten free; for some weird reason there is gluten in many varieties. Kitchen Basics is great or Kitchen Accomplice concentrate (used that this time) is very convenient; squeeze bottle in the fridge. 2 large ears of corn; cut off the cobs. Directions: Sauté the diced bacon in a large heavy saucepan. Remove the crisp bacon. Add the onion, carrot and celery. Sauté ten minutes, until the vegetables are fairly soft. Add the potato, broth, thyme, and corn cobs; simmer 15-20 minutes until the potato chunks are soft. Remove the thyme and corn cobs. Add the corn, cream, salt and pepper. Cook 3-5 more minutes. If it seems too thick add up to another half cup of broth. Serve with the bacon sprinkled on top or stirred in. Optional additions which I didn’t use; half a red bell pepper cooked with the carrot/onion/celery, half a sweet potato diced and added with the white potato and 1 diced tomato and some chives sprinkled on top of the soup. I might try some or all of them next time, yes I plan on making this again soon before the corn gets too tired; it was delightfully fresh tasting. You could leave off the bacon if you are meat free; substitute in some good quality olive oil; maybe 2 tbsp. of it and use a veggie broth instead of the chicken broth. It was perfect just as I made it but I am betting any number of variations would work. Have fun with what you have available and what you like to eat. Soup isn’t as technical as baking so mix it up! That is my philosophy of cooking with veggies.